The draft guidance has been published in English and Welsh and there is also a children’s version, described in the Equalities Impact Assessment as ‘easy-read, youth-friendly version’. Since I don’t read Welsh, my comments are restricted to the English documents. As soon as the public consultation opened on May 8th I found it hugely difficulty to decipher the children’s version and compare it for accuracy and consistency with the standard version. For some unfathomable reason the children’s version was only provided as an illustrated pdf with the text disappearing into asymmetrical columns of mustard and greyish blue, further obscured by large cog wheel illustrations. The second thing I did – on May 29th, 3 weeks into the 8 week consultation – was to write to the address given on the consultation page for requesting documents in an alternative format. I chased it up on June 6th. Things only started to go right on Friday June 12th, 5 weeks into the 8 week consultation – when a very helpful person in the Department for Education and Skills sent me a plain text version and when I asked if it could be uploaded to the consultation page for everyone’s benefit this was done promptly, straight after the weekend and is now available here. Why does it matter that we only get a document in a useable form three quarters of the way through a consultation? Firstly, it is ironic that something which should be EASIER to read is in fact harder. Secondly, it is unacceptable that children were only being asked to give their views once they had decoded the mustard/grey asymmetrical columns with vanishing-into-the-background-text pdf. 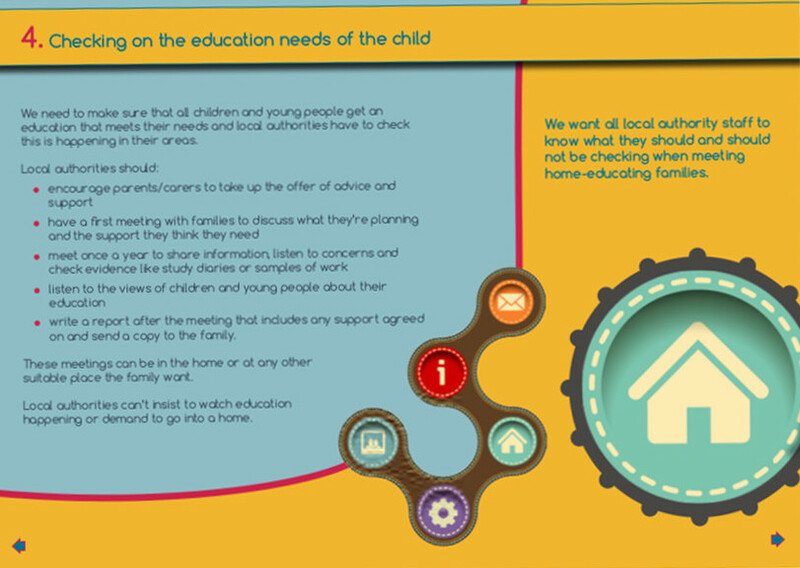 Thirdly, in the specific context of home education consultations, we are unfortunately alert to possible discrepancies and need to be able to set the 2 documents side by side for comparison. In a previous consultation, the Welsh Government used the children’s (‘Plain English’) version for discussion at focus group events which prompted a number of complaints about the changes being played down since the children’s version gave the impression of a much more benign system More here. The consultation closes in 16 days on July 3rd. This entry was posted in Uncategorized and tagged Government Guidelines, non-statutory guidance, Wales, Welsh consultation on June 17, 2015 by Fiona Nicholson.